George Mallory was a leading member of the early expeditions on Mt. Everest. His mysterious death and disappearance on the mountain in 1924 was proof early on of just how dangerous and formidable Everest can be. In the above quotation Mallory explains the immense joy and life affirmation he gained from climbing on the mountain, despite his inability to ever reach the summit. Today, hundreds of individuals come to Mt Everest in pursuit of this same joy, this same exploration and this same affirmation that life is meaningful. Each year more and more climbers come from all over the world for a chance to reach the roof of the world and experience a piece of this joy. But as traffic jams build at the top of the world, the question becomes; when will the risks and costs of pursuing Mallory’s “joy” become so great that the mountain can no longer sustain? On April 18, 2014 an avalanche in the Khumbu Icefall killed sixteen Everest sherpa guides. The Khumbu Icefall, not far above basecamp and southwest of the summit, is one of the most dangerous and technical aspects of the ascent up Everest. Climbing season had just come underway and some of the earliest expeditions waited at basecamp as sherpas from several expedition companies went ahead to set ropes and ladders and to transport gear and equipment up to the second camp. 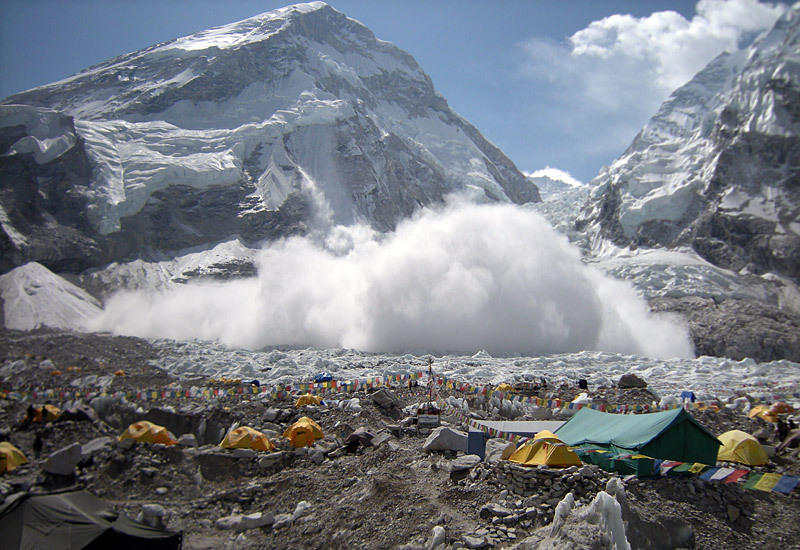 At 6:45am local time a large serac, an unstable block of ice forming on the lower edge of a hanging icefall, collapsed burying at least twenty-five sherpas. Sixteen were pronounced dead, but only thirteen bodies were recovered. It is the deadliest avalanche in Everest history. On April 22 the sherpa community announced that they would not work on Everest for the 2014 climbing season out of respect for those lost in the avalanche. The sherpa boycott of the 2014 climbing season marks a transformative moment for the future of Everest climbing. The inequality between the guests on the mountain and those who work there has become immense over the last hundred years and something must now be done to bridge the gap. This is not the first time that sherpas have asked for more respect and more support. Last year there were clashes between sherpas and Westerners as climbing numbers increased and traffic jams on the mountain led to unmanaged risks. Along with the boycott the sherpa community is demanding fundamental changes such as better insurance coverage, higher payment for injuries and deaths, education and information of dead and missing family members, and rehabilitation assistance. Everest sherpas are asking the Nepali government to shuttle food, propane, tents, and other gear by helicopter up to the second camp. The Nepali government, however, has not conceded to the majority of the sherpa demands and many suspect that even if the government does agree to the demands they will fail to follow through on their promise. The number of climbers continues to increase on Everest and more climbers means more trips, more to carry, more demands, and more risk. Without the sherpas the climbing season on Everest would not be possible, certainly not to the extent that it operates now. Some wonder why Westerners can’t carry more of their own gear and become more self-supported on expeditions. The reality, however, is that Nepal relies on tourism and the climbing industry for a majority of its economic income. In an interview conducted by the Wall Street Journal, Nima Doma Sherpa, 30, whose husband died in the avalanche explained, “No mountaineering means no tourists. No tourists means no jobs and no jobs means no income.” Nepal is the second poorest nation in Asia (second to Afghanistan) and the country suffers from massive unemployment. One-quarter to one-third of Nepal’s GDP every year comes from millions of Nepal’s young men who go over seas to work in the Middle East, Malaysia, and India. If sherpas don’t work on Everest they will most likely be forced to go work overseas. Additionally, if sherpas decide not to return to the mountain others will, other ethnicities, others looking for work. NPR’s On Point conducted interviews with the youngest generation of Nepalese sherpas following the Everest avalanche. These young men told NPR that they work as sherpas so that they can pay for their children’s education so that they will not have to be guides on Everest themselves. The majority of Nepalese men working in Nepal rather than overseas are either potato farmers or carpenters and either way they can’t save enough money for their children’s education. Sherpas risk their lives on Everest to support not only their immediate family, but their extended family and friends as well. Sherpas can make more in two months than the entire rest of their family can make in a year working as subsistence farmers. In two months a sherpa can make $6,000 in a country where the average annual income is $550. Next year has become a huge question mark. Will the sherpas return to the mountain? Will the Nepali government concede to the demands of the sherpas and will they deliver on their promise? How will the growing risks on Everest be managed? How can we prevent “traffic jams on top of the world”? Some argue that the number of expeditions on Everest must be limited to somewhere around twelve to fifteen per season. Others argue that a lottery system should be put in place similar to that used in the Grand Canyon. As of now, the Nepali government has lowered their fees to climb Everest next year. That means more people and what Everest needs right now is to limit people on the mountain whether by lottery, money, or experience. What was once a small and specialized exploration (Sir Edmund Hillary and Tenzing Norgay reaching the summit for the first time in 1953) has now become a massive overloading and overcrowding tens of thousands of feet in the sky. As George Mallory explained, we climb for the joy, for the thrill and purpose that we feel, and because the mountains have some sort of pull on us that we cannot resist. When I was twelve years old I had the chance to talk with David Breashears, an American mountaineer and filmmaker who has summited Everest several times and spent a great deal of time on the mountain. As David spoke to me over the phone from Everest basecamp, I could feel the excitement he drew from the mountain. In that moment I wanted nothing but to experience what he was experiencing. I felt Everest’s pull and I wanted to know what it would be like to stand on the summit, to stand on the top of the world. There is much to be learned in the mountains, much to be gained from climbing the world’s highest peak, but how much are we willing to risk for a shot at the joy of reaching 29,035 feet? How much are we willing to risk ourselves and how much are we willing to have others risk on our behalf? April’s avalanche marks a tipping point in the Everest climbing community and only time will tell what the future of the sherpa community will be. The sherpa saying among Everest guides is, “We service the needs of many who come to claim Everest as their own.” If sherpas continue to serve the needs of Westerners above their own needs and the needs of the mountain, Everest will surely collapse under the weight of its tourism. We need to find a way to foster a symbiotic relationship between guests, guides, and the mountain. We must find a way to follow the joy that Mallory describes, the joy that pulls us into Everest’s orbit, but we must also protect the mountain and its sherpa guides. Think about donating to the families of the sherpas lost in the Everest avalanche. Whether it is a lot or a little, you will be surprised how far your dollars go in Nepal. Donate to the Sherpa Family Fund here.